What do you get when you cross Stefan Kudoke with an octopus? The KudoKtopus of course! "Hand made" is a designation that we get very tired of hearing from many watch brands. 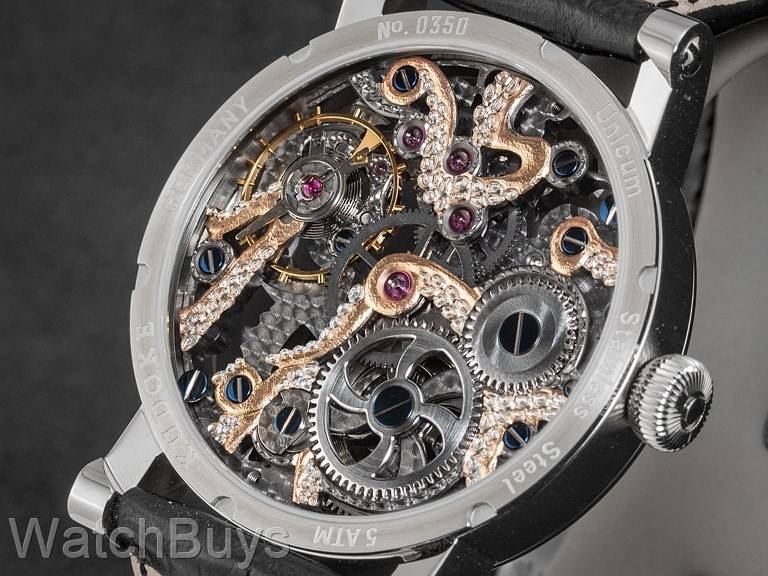 Yes, there is some degree of "hand made" in the final assembly of most mechanical watches, but the real truth is that most of the watches today are produced by CNC computer guided robots, which can cut, polish, engrave and perform many other tasks in a very precise way. There are certainly parts of this watch produced using CNC technology - after all, the tiny gears must be an exact size to ensure reliable timekeeping. But what makes Stefan Kudoke's watches different is that "hand made" is really true. Take a minute to enlarge the pictures above and you'll see what hand workmanship is all about. 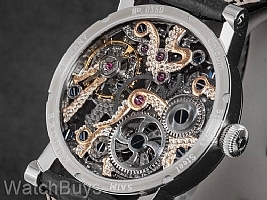 It takes Stefan Kudoke months to create a watch at this level, and this model is rightfully called a work of art. We love the integration of the octopus form on the front of the watch and the fact that it does not detract from the overall design. It is stunning, and unlike any other watch you'll see on another wrist. Stefan Kudoke produces his watches in extremely small quantities - it is not uncommon for us to receive only 1 or 2 pieces of a series in a year. "With its eight all-embracing tentacles the KudOktopus is wrapped in rose gold and rhodium which entangles the steadily swinging balance. Holding wheels and screws tightly capture the most precious - time." This watch features a stainless steel case that is 42 mm in diameter with sapphire crystals on both the front and back. 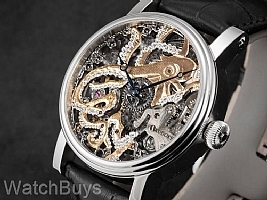 The straps are attached to the lugs by screws, and the escapement and escapement wheels are all hand polished. The hands are in a Breguet style and are tempered in blue. We love how Stefan uses various colors of gold to highlight special parts of the movement, a bridge or a wheel. This watch features a black calf leather strap with a Stefan Kudoke signed tang buckle.